This is Dumb Mondays, tipping off the workweek with silly facts, opinions, or predictions that you may or may not find interesting. This is JaoSming’s feature, but he’s a little short on time and availability at the moment, so I’m filling in for him. If you’re a regular listener of the NLSC Podcast – and you absolutely should be! – then you’ve probably heard me complain on multiple occasions about the scripted approach to MyCAREER in NBA 2K14 on PlayStation 4 and Xbox One. That’s just a matter of personal taste, but I do have another gripe that I’m sure quite a few people will agree with. In short, the grading logic in MyCAREER could stand to be tweaked, as it seems to be geared more towards punishing mistakes than rewarding good play. And frankly, it’s making a filthy hypocrite out of me. You see, I consider myself a sim-oriented gamer. Sure, there are times when the AI isn’t playing fair and I respond to its cheese with a little cheddar of my own, but for the most part, I like to run plays, do more than just attempt dunks and layups on every trip down the court, and to paraphrase the immortal words of Da_Czar, play basketball rather than a video game. I want to see the AI employing realistic strategy, the right players taking the most shots, and everything else that you’d associate with the concept of “sim”. But like I said, sometimes that philosophy has to go out the window. This is particularly true of MyCAREER. Whether it’s Skill Points or Virtual Currency, the rewards are pretty stingy, unless you’re putting up really big numbers every game. With the starting ratings so low, and the grading system seemingly set on making deductions at every turn, you find yourself padding the stat sheet anyway you can. And so, I dunk. A lot. I generally play as a 6’4″ point guard or shooting guard, so I do take a fair amount of threes as well. I’ll also take the occasional midrange jumper, but when I want to make sure that I can put some points up on the board – especially if I’m taking on a dynamic goal such as “make your next shot” or “hit three of your first four shots” – I’m taking it to the hoop for a dunk. 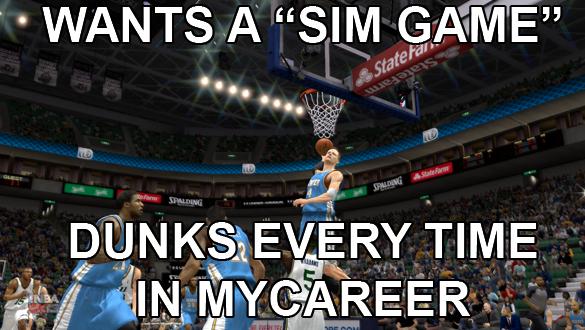 This strategy is particularly cheesy in NBA 2K13, since dunks can’t be blocked. But hey, as Shaquille O’Neal once said, if you can get the dunk ten out of ten times, then you go for the dunk, ten out of ten times. While I’m confessing to shameful stat-padding strategies, I should mention that I also call for the ball with the shot clock winding down, then whip a pass to a nearby teammate (usually a good three-point shooter on the wing) so that they have to put up the shot. That’s usually a good way of picking up some extra assists, and helps out immensely when you’re trying to maintain your season averages, or chase a triple double. Similarly, at times I roam a little too much on defense, just so that I can swoop in and grab a few extra rebounds. All this for a few extra Skill Points, and to avoid being scolded by fans on the fake Twitter who call a point guard a slacker when he only gets two rebounds, or deem it selfish when their shooting guard only dishes out a couple of assists. For the record, a minimum of 10 points on 50% shooting or better, three rebounds, three assists, and at most only a couple of turnovers will generally be regarded as a satisfactory performance, as long as your team wins. And that’s what’s really dumb about the whole thing: I’m meeting that standard to avoid getting stupid comments from people who don’t even exist! And to earn Justin Bieber’s respect, obviously. Of course, I’m also doing it to earn those all-important Skill Points/VC. Truth be told, I’ll probably still indulge in some stat-padding in NBA 2K15 and beyond, even if the grading system is fairer and the fake Twitter responses a bit more reasonable. I’m sure that I’ll still dunk a lot, too. After all, I’ve never been able to perform the variety of dunks in real life that MyPLAYER throws down on a regular basis. Not on a regulation hoop, at any rate. When it comes down to it, I’ve accepted that I take a different approach to MyCAREER than I do with Association, MyGM, or NBA Live’s Dynasty Mode. And once Rising Star is fleshed out a bit more in NBA Live 16 and beyond, I’ll probably do the same thing with it, too. I’ve decided that I’ll leave the sim play to those other modes; MyCAREER is already a bizarre enough reality, where I’m an NBA player. I might as well have some fun with it, even if it makes me a hypocrite for the dumbest of reasons. Do you actively pad your stats in MyCAREER? What are some of your favourite strategies to do so? Let me know in the comments section below! Yes, I do pad my stats in MyCareer. One of my favorites is the Post-up – Drive Cheese where you basically post up the defender and then let your player drive to the basket since either: He will reach for the ball resulting to either a posterizer against the other defender guarding a rim or a free dunk OR if the AI is too slow to make contact with your move and you end up making up a cheesing layup. One of the things that I hate about MyCareer is the way VC/SP is given to your player and how cheap the attributes are. After I play a total of 20+ games, 63 becomes 78 or even higher PLUS I get the starting spot, which is very unrealistic. Oh and yes, I also call for the ball with the shot clock winding down, then pass it to a nearby teammate so that they have to put up the shot. Also team formation doesn’t matter, I am 60-0 in my first season as a point guard on he Celtics playing alongside Rondo without a rim protector. I went 73-9 in my first season in NBA 2K13, and am currently 38-1 in my second season. This also led some more unintentional humour with the fake Twitter when the streak came to an end after about 33 or 34 games, with fans treating it like it was yet another loss, instead of an epic streak unfortunately concluding.